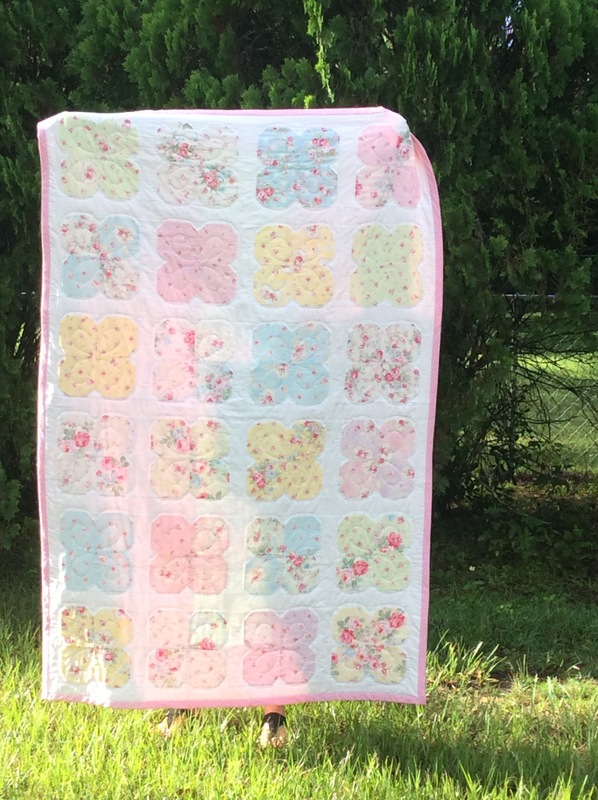 Quilt for baby grand girl. I’ve been away from my blog for way too long… hurricane, working, traveling, . . .
All good reasons, but I must say… I miss you! I finished the quilt for my youngest grand baby and wanted to share it with you. I used Princess Rose fabric by Lecien. And made the Flower Garden pattern in one of MSQC tutorial. I made a standard-size pillow cover so she can use it when she gets into a bigger bed. I just did it in my own square patten…it was actually a mistake, but when it was finished, I thought it looked nice. The fabrics ar so soft and beautiful! I loved the way they looked together! I made a little pillow with one of the squares, so she could use it anywhere. 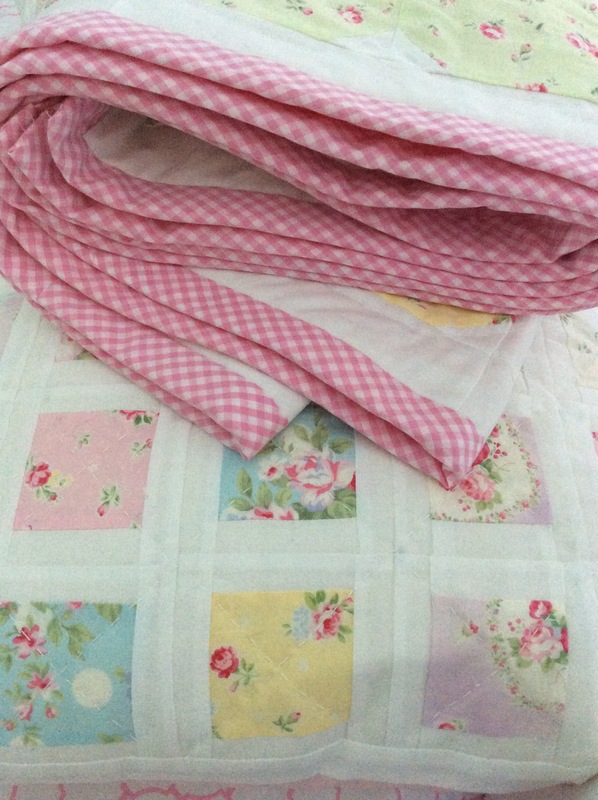 For the binding, I used a pink gingham…tiny squares….I love gingham of any color, but this one was just right for this baby girl quilt. I hand-quilted it in a petal pattern. I actually cut a piece of cardboard in a petal pattern and traced it inside each flower petal. 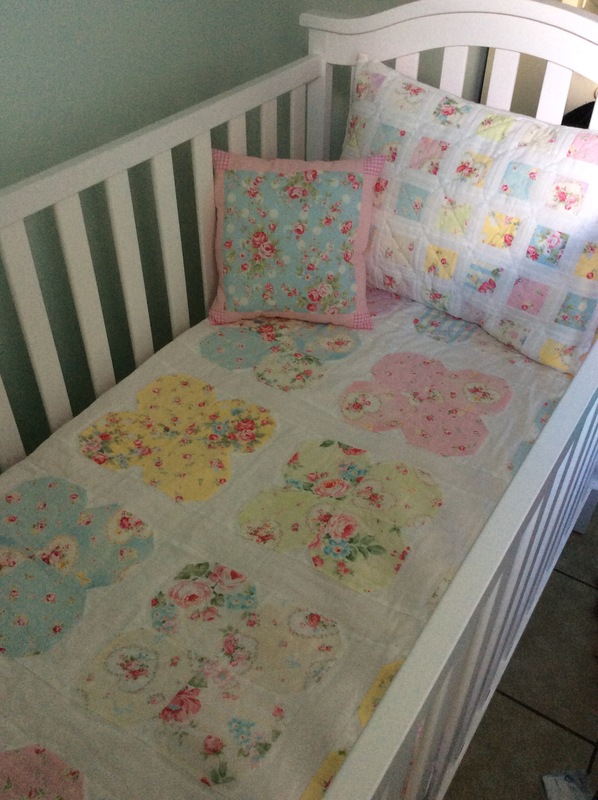 Then I quilted around each petal on the outside to echo the flowers. I was really happy with the way it turned out. 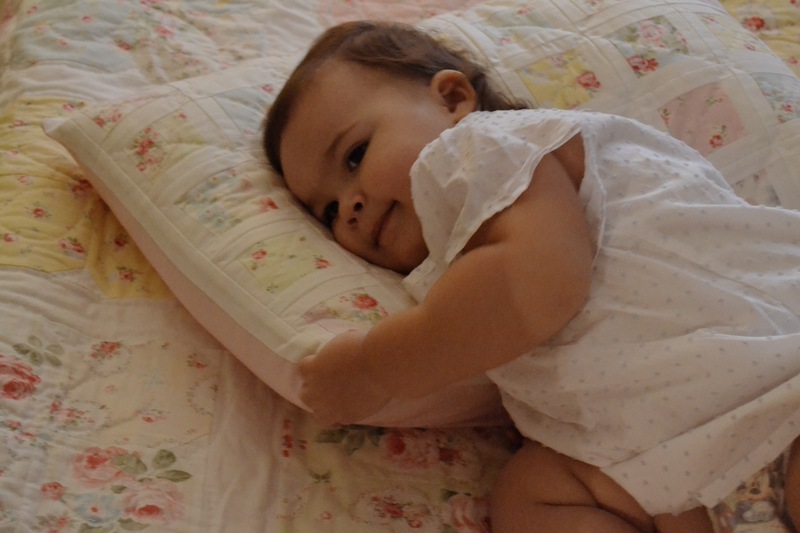 As I quilted, each evening, I’d pray for my baby granddaughter. She is a joy and a gift from God. The pillow case has a zipper in the back so my daughter can just take it off and wash it whenever it needs it. 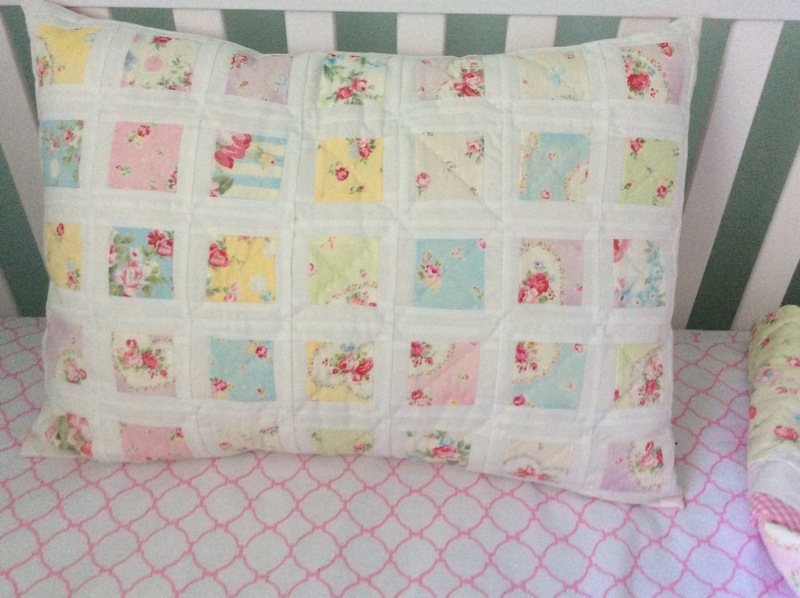 I just hand-quilted across each square…sometimes simple is best. This is not a good picture, but it’s the only one I have of the whole quilt top. And this is the back. You can really see the quilted pattern here. 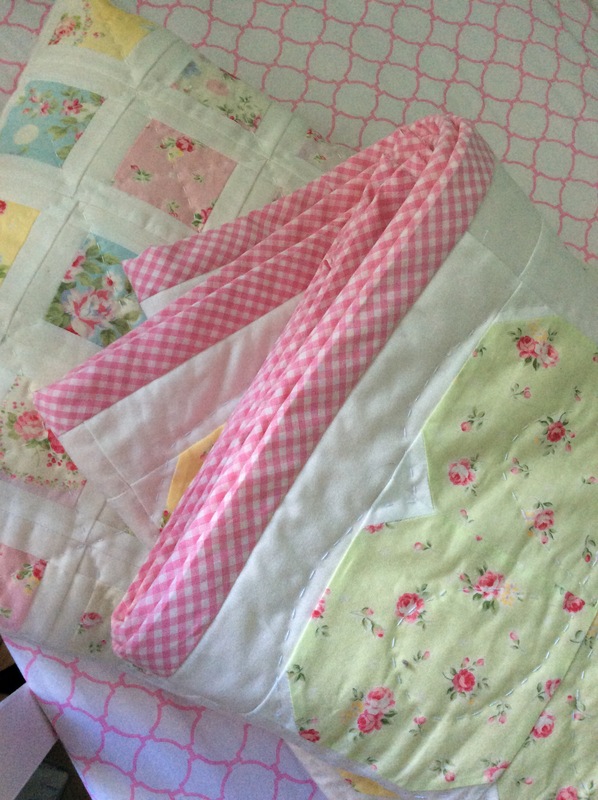 I’m thrilled that I was able to give each of my granddaughters a quilt for their first birthday! Absolutely beautiful, you are so talented. 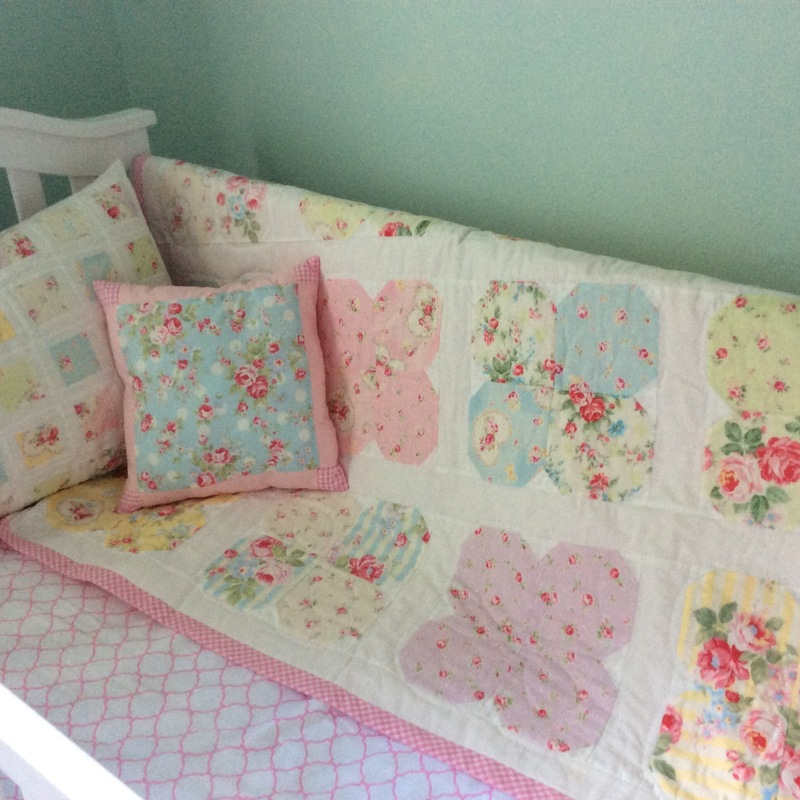 I can’t believe how professionally done that quilt and pillow are. 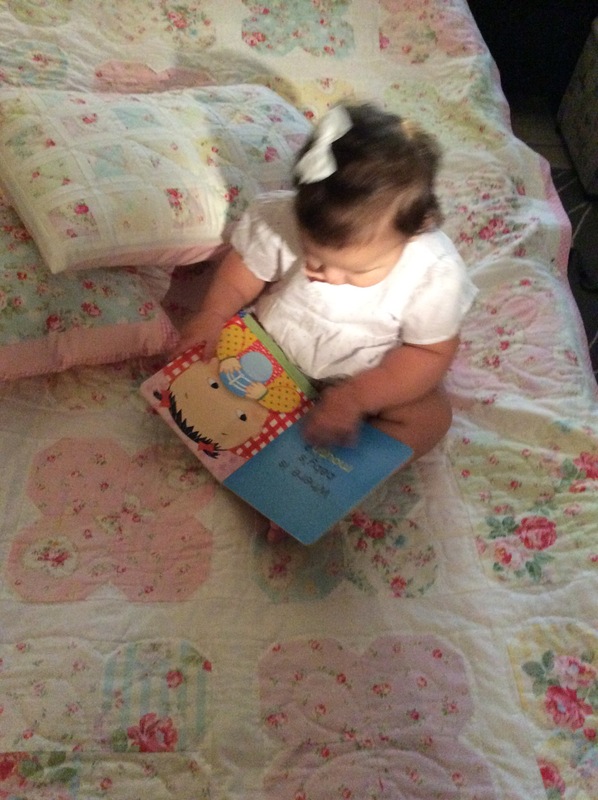 The photos of your grand daughter laying there are just adorable. Wish I had your talent and patience. That was truly a labor of love. So good to see you blogging. You are so sweet! Thank you so much for such kind words…it really is good to be back blogging – I’ve missed it. Computer problems were the main reason I haven’t been able to keep up. The phone app doesn’t always work. I didn’t know how much I missed having a working computer until I finally got one! So beautiful! Don’t tell anyone that one pattern was a mistake! Haha – 🙂 and Thank you! I sure hope so! Thank you for stopping by! …and for your kind words. 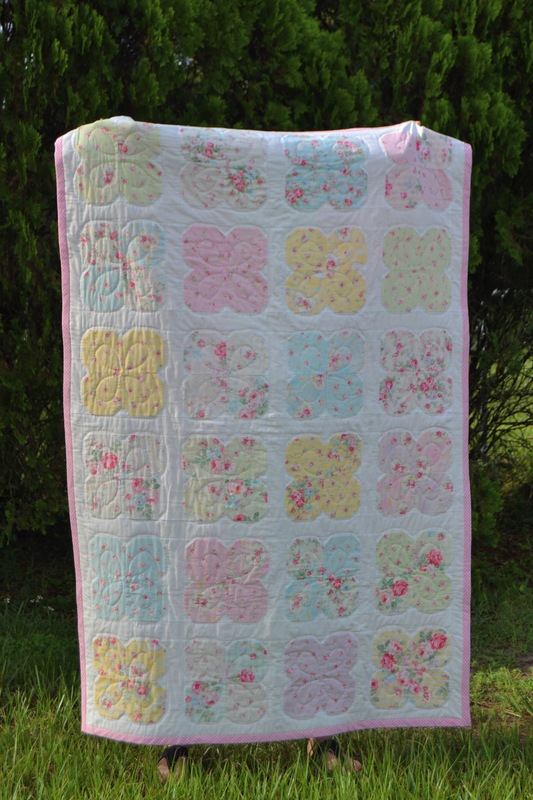 I was awestruck looking at all of the beautiful quilt pictures, then saw that gorgeous baby. How wonderful for you to have her in your life. Lillian, it is so good to hear from you! I hope you are doing well! Thank you so much for such a sweet comment. I sure appreciate it. I am still plugging away at the Bear Paw quilt…slow and steady. I should’ve made a baby size…what was I thinking?!!!! Your granddaughter is so beautiful! You did a great job sewing for her! Yes, I have to say she is a cutie and melts my heart whenever she laughs at my silly faces or gives me a kiss. 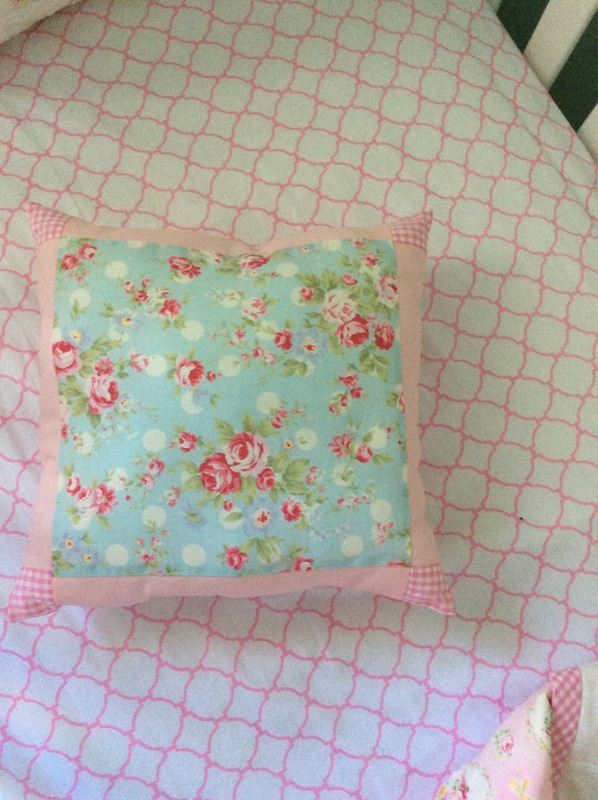 It is so much fun sewing for little ones! I love this. Pretty, pretty. Just like the baby. 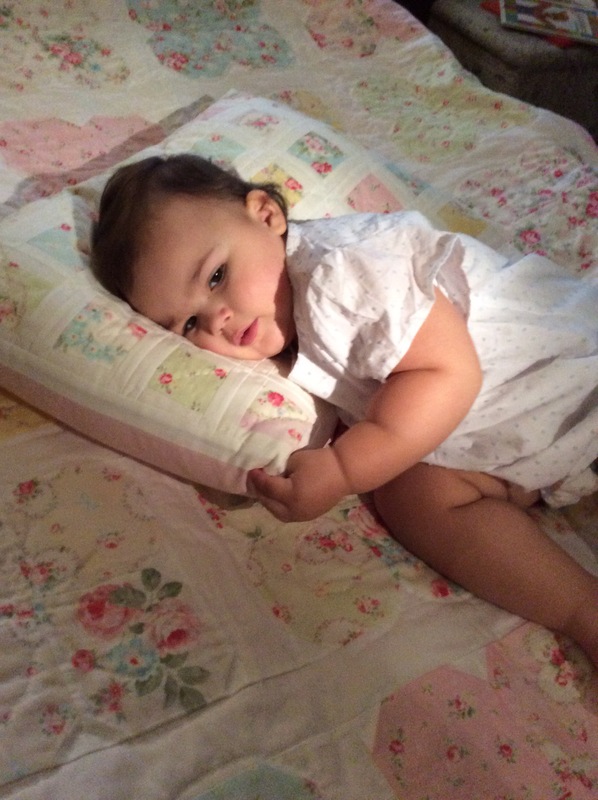 Daisy–you little grand-girl is adorable– so sweet and pretty sitting on the quilt! 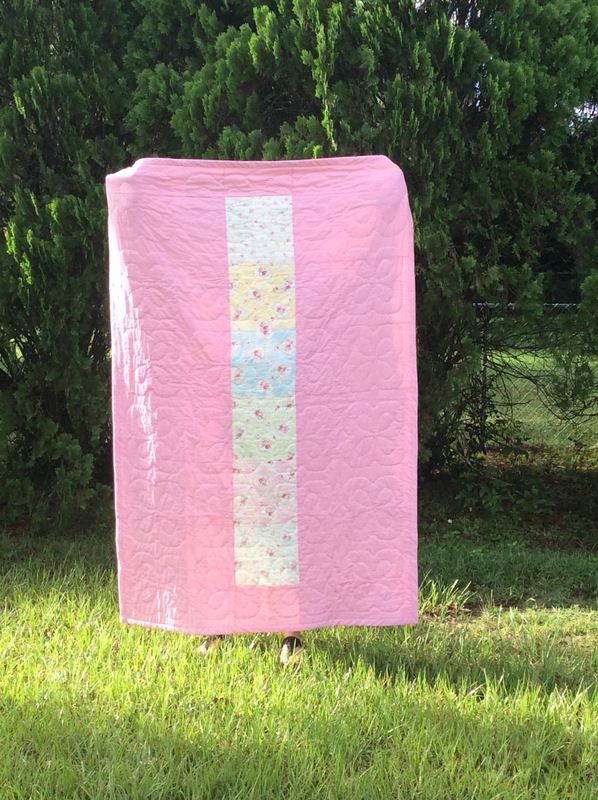 Loved seeing it all stretched out– and the quilting on the back! loved it! And the pillow! It was so sweet and simple and pretty. I’m so glad you took pictures and let us all have a peek– I especially loved how the clean white set off the beautiful pastels. Hooray- what a grand gift for that little girl. I’ll bet she’ll keep if for always. Fun post Daisy!! That does sound fun Daisy!! Don’t you love to hear they are really using the quilts. 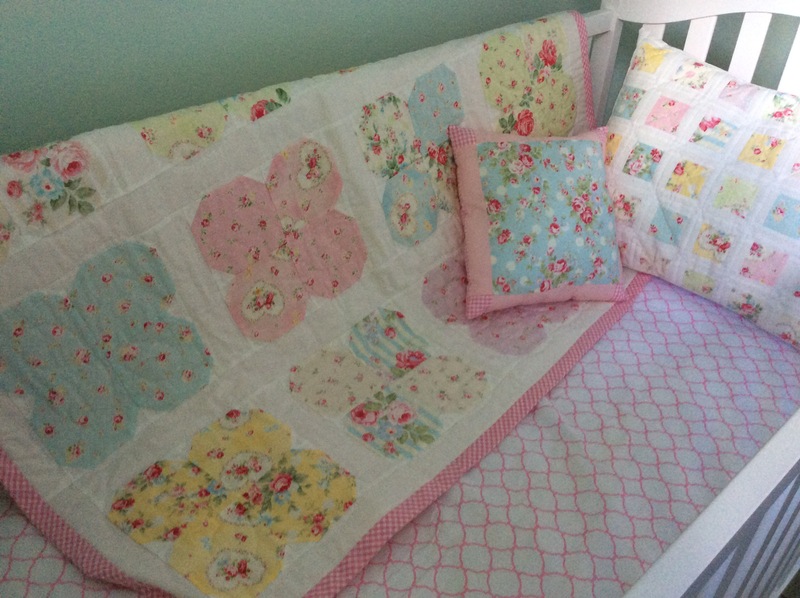 I took quilts to the grand-girls when they were born in China and when they moved back here to California, I wondered if they would bring them and they did! I love seeing them on their beds here. Happy sewing! The hurricane did not affect us – just a couple shutters that flew off, and lots of trees/branches all over the front & back yards. I don’t really have a “job”, …I “work” alongside my husband in the ministry we’re in, which is overseeing Pastors & churches in our area. It involves lots of different things…meeting with pastors, churches, counseling, training, giving assessments, leading events, speaking, etc. We also have to be trained in different areas, so sometimes we travel for that. Hey Daisy– I’d love to be in touch. thanks for the email address… Are you started any Thanksgiving cooking yet? we just have cranberry sauce/bread on the lit for today. “talk” to you soon… thanks! What a sweet comment! Thank you so much! I’ve missed all the blogs I follow, including yours, and I’m so glad to see all the beautiful things everyone’s making! Wow! Beautiful quilt! And gorgeous baby! I wish I could quilt like that. I thought I wouldn’t be able to quilt because I was under the impression it was so difficult, but it’s actually easier than I thought. Tutorials online and all the new fabric collections – those two things is what made me start quilting, and now I love it! Daisy, this is SO sweet!! 🙂 Beautiful all around!